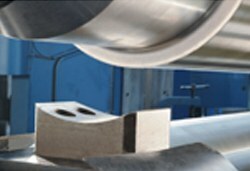 After aligning the plate in the roll and using the back roll as a reference point, the material is accurately, squarely and securely clamped between the top roll and pinch roll, preventing the plate slipping resulting in the best possible results, even taking into consideration inexperienced operators. 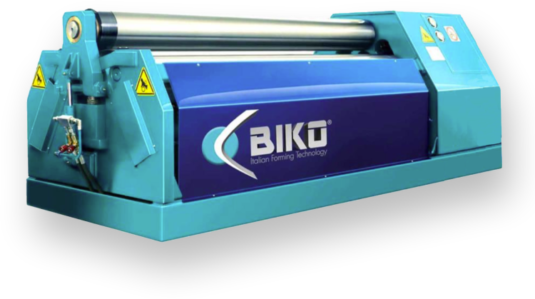 As with all Biko machines the structure consists of a heavy duty steel frame resulting in the strength, rigidity and reliability expected from this quality manufacturer. The benefits of the 4 roll design, including one man operation, reduced reliability on handling equipment due to the possible use of feed tables, possible one pass rolling which also reduces workshop floor space, this range of machine is usually sought after by manufactures who would possibly have a product, i.e. boiler manufacturers, pressure vessels, wind towers etc. Form pre-bend on trailing edge with roll B. 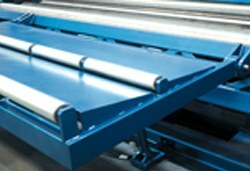 Primarily used when rolling larger diameter open shapes, the side support is used to prevent the weight of the material re-opening the rolled diameter as the material traverses through the rolls.